Pears. We poached them, we stuffed them, we ate them, we loved them. There was a time not long ago when I was unable to say I'd eaten poached pears, but now that time has come and passed. I just had my first encounter with a poached pear. It ended with a prediction of events to come, and what does my future hold? More poached pears, of course. 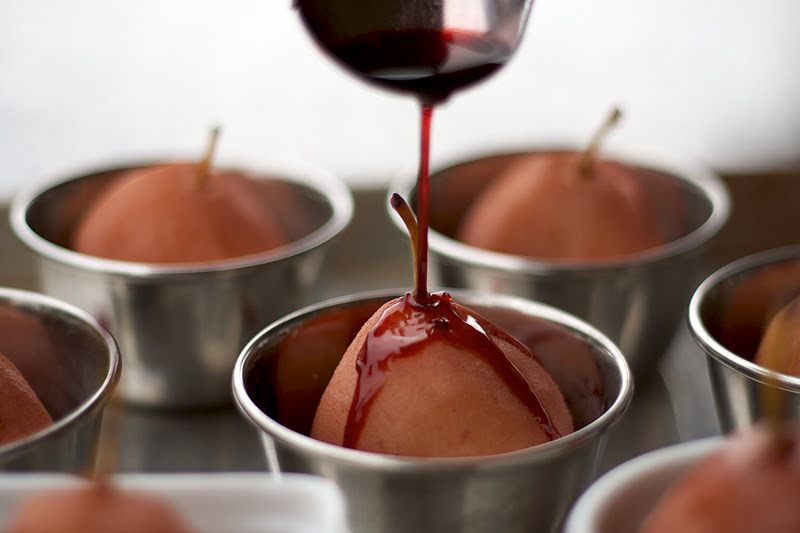 Earlier this week, I shared with you a batch of pear crisp minis, and today: wine-poached pears. These weren't just any ol' poached pears, either. They were stuffed with the one of the best sweet ingredients on this earth -- chocolate. Not just any ol' chocolate, either. Good chocolate. Good idea. My team-up with Marilena and Leah of Plump Me Up yielded great eats, and they were the baking masterminds who came up with the combo. I never would have thought the pairing would work so well, but it completely won me over. After simmering the pears in red wine, we put them in little bowls and ramekins. They proved to be the perfect fit for the small fruit, and when Marilena poured the remaining wine sauce overtop of each pear… wow. All I could think was, why have we never done this before?! Just as I had done with the pear crisp minis, I attacked a poached pear with my spoon. I was pretty impressed, especially when I hit the oozing melted chocolate center. Pretend I just showed you an amazing picture of the oozing chocolate centre. In actuality, the sun went down much too fast, and the lack of daylight just wouldn't have done these beauties justice. And hey, if you really want to see the chocolate… you can experience the goodness firsthand by poaching some pears, stuffing them, and giving them a taste. You never know until you try, right? "Delicious" doesn't seem a fancy enough word to describe this dessert. Peel the pears, keeping the stems intact, and trim the bottoms of the pears so they can stand. Place the pears in a deep saucepan. In another saucepan, pour in red wine, lemon zest, lemon juice, sugar, cinnamon, and vanilla. Bring to a boil. Pour wine mixture over pears and add enough boiling water to cover. Simmer slowly, just until the pears are tender. Test by inserting a skewer. Carefully remove the pears and transfer to a dish to cool slightly. Bring the remaining wine mixture to a rapid boil and reduce until only about 1/2 cup remains. 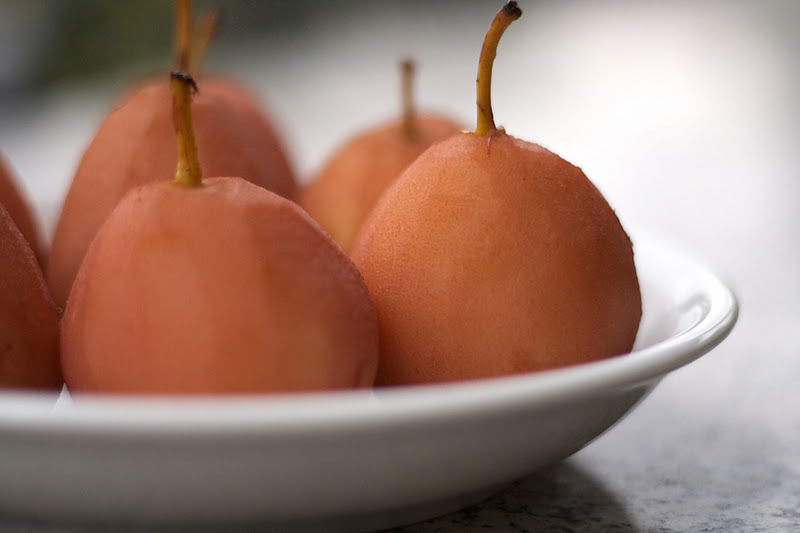 Preheat oven to 350 degrees F. When pears have slightly cooled, insert a very small spoon or melon baller into the bottom of each pear and hollow out the center. Scrape out any seeds. Stuff the hollowed pears with pieces of chocolate until full. 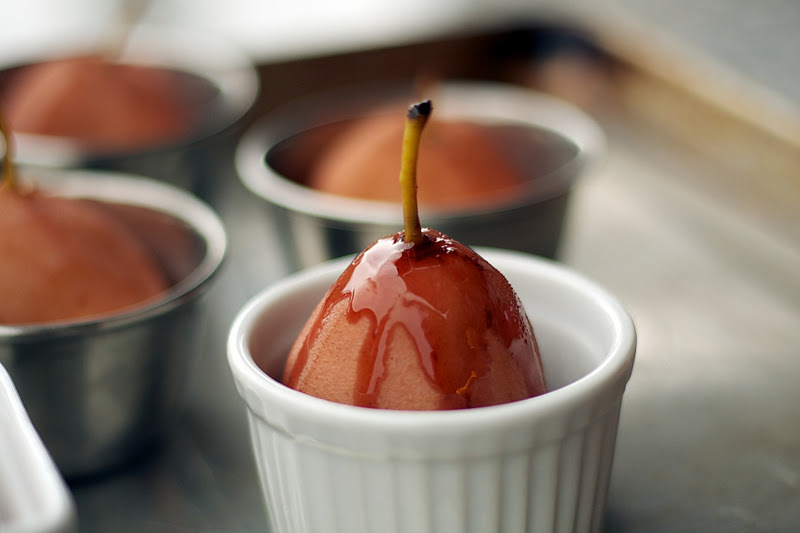 Place each pear in a small ramekin or oven-safe dish. Pour the reduced red wine sauce over pears, and place the dishes on a baking sheet. Heat the pears in the oven for 5 to 10 minutes, or until the chocolate has melted. That looks orgasmic. I will so absolutely have to try this. I'm already salivating! This is must stunning. I am in awe. Beautiful photos! I'm now craving for these pears! Oh, gosh, these are stunning! The dish, the photos...all amazing! Wow this looks incredible! Yum. Lovely shots too! Love your gorgeous photos! They look fantastic. That is so darn brilliant of you to stuff them with chocolate! What a great idea- I love red wine poached pears (have a recipe on my blog too) but would have never thought of stuffing them with chocolate. Must have tasted great! I don't think I've ever had poached pears but the addition of stuffing them with chocolate is brilliant. Yum! Wow! What a delicious blog you have here! These pears look incredible! And your photography is impressive! Hi do you have a suggest red wine to use with this recipe? and should this be served hot or cold? and approximately how long did it take you to prep and cook this? my parents are coming home this weekend and i'd like to make this for them! thanks! Hi Christine, this dessert is served hot and should be ready in around 40 minutes, with prep and cooking time. As for the red wine… I wish I was more knowledgeable in that department (I'm 16 and can't say I'm an expert on the subject, haha) but I would suggest you use a good red wine that you enjoy drinking. If you wouldn't drink it, don't cook with it. I wish I could be more helpful! Thanks for your question and I hope all goes well!